Upon entering Camels Garden 308 you are transported. Incredible, statement making art greets you right inside the door, setting the scene for the global cornucopia of meticulously chosen furniture and upholstery waiting for you throughout the home. 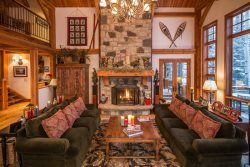 Located just off the slopes on Oak Street and complete with a mudroom and ski locker, this ski in ski out property is perfect for winter adventurers. On the other hand, summertime spent here is nothing other than sumptuous - filled with views of the valley right off of your private wrap around deck and the mouth watering aromas of whatever delicacy is smoking on the grill. Spacious Modern kitchen - fully appointed. Large open Living Room with views to die for and lots of comfy seating options an large flat screen TV. Wrap around deck with unobstructed views of the end of the valley. The common hot tub / pool is right downstairs. Was very impressed with the professionalism and friendliness of Lat 38. We are friends with the owners, and shared our positive experience and impression them.